HONG KONG – Parliamentarians from several Asian countries are poised to meet and discuss ways to end the widespread practice of torture and ill-treatment in their countries. The three day meeting will take place in Kowloon, Hong Kong, starting on July 21st. The meeting is a significant step towards the implementation of the United Nations' Convention against Torture and Other Cruel, Inhuman or Degrading Treatment or Punishment (UNCAT). Parliamentarians from Bangladesh, India, Indonesia, Nepal, Pakistan, Philippines and Sri Lanka have already confirmed their participation. Several prominent human rights activists from South and South-East Asia will also be traveling to Hong Kong to contribute to the discussion. The meeting is sponsored by the Asian Alliance against Torture and ill-treatment (AAATI). AAATI was initiated in July 2011, when a group of human rights activists from several Asian countries came together under the auspices of the Asian Human Rights Commission (AHRC), Hong Kong, and the Rehabilitation and Research Centre for Torture Victims (RCT), Denmark. The alliance aims to make a concerted effort to introduce legislation in all Asian countries along the lines of UNCAT, and to ensure effective implementation of such critical laws that can safeguard human beings from torture and ill-treatment. John Clancey, Chairperson of the AHRC, will present the keynote speech, and Dr. Jan Ole Haagensen, Director of the International Department of RCT, will present the theme paper, which will seek to provide an overall approach and strategy for effective elimination of torture in Asia. Several prominent members of Hong Kong human rights community will present their unique perspectives. And, the invited parliamentarians from each country will present papers on the subject, which will be discussed by all participants. Professor Ole Espersen and former Minister of Justice, Denmark, has sent his greetings to the participants of the conference, stating that the "right not to be exposed to torture is in fact no real and genuine right if it is not combined with an effective remedy for the victims to make use of a legal machinery to have what the victim had to suffer redressed and guilty persons punished." In addition Professor Espersen has noted that the "ultimate responsibility for the national fight against torture – and all other human rights violations, rests with the parliament and the government in each country." This meeting of parliamentarians from across Asian nations, who will gather in Hong Kong for the sole purpose of considering possibilities on how to bring an end to torture, is an unprecedented event. CAMP RUPERTO KANGLEON, Palo, Leyte – PNP PRO 8 reports that a man who escaped from jail on January 3, 2010 wanted for Murder was arrested Monday afternoon. At about 12:40 in the afternoon on July 16, 2012, combined elements of Northern Samar Provincial Public Safety College, Northern Samar Provincial Special Operations Group and Lapinig Police Station led by PSI Arnoldo Picardal Gomba, PSI Joseph Abalos Imperial and PI Ambrasio Villarino Demain respectively conducted a manhunt operation at Barangay Lapinig Del Sur, Lapinig, Northern Samar. This resulted to the arrest of a certain Joey Quias Del Monte, 37 years old, single, jobless from Barangay 185 Malaria, Caloocan City but presently residing at Lapinig Del Norte, Lapinig, Northern Samar. Del Monte is an escape from the Leyte Provincial Jail, Baybay City on January 3, 2010 and charged for Murder docketed under Criminal case number 8-2000-10-83 at RTC Branch 14, Baybay City, Leyte per certification dated July 4, 2012 issued by PGIII Antonio G. Ublado, OIC Leyte Sub-Provincial Jail, Baybay City, Leyte. Subject person was then brought to Lapinig Police Station for documentation prior turn-over to Northern Samar Police Provincial Office, Catarman, Northen Samar for subsequent turn-over to Sub-Provincial Jail, Baybay City, Leyte. MANILA – Vice President Jejomar C. Binay on Wednesday said Japan shares the Philippines’ concern over the recent failure of the foreign ministers of the Association of Southeast Asian Nations (ASEAN) to agree on a code of conduct in the West Philippine Sea. The Vice President arrived Wednesday night from a three-day trip in Tokyo where he gave the keynote to an international cybersecurity conference. Binay said Japan’s Deputy Prime Minister Katsuya Okada expressed concern over the failure to issue a joint communiqué during the ASEAN meeting in Phnom Penh, Cambodia, but hoped that ASEAN would continue discussing the issue among its members, and between themselves and China. “Japan, as you know, has its own problems with China, concerning Senkaku Islands, which are controlled by Japan but claimed by China. Some kind of tension has recently arisen after it was reported that the Japanese government plans to purchase the islands from their private Japanese owner, and nationalize them. This has provoked a reaction from Beijing,” he said. The Vice President said that there was a need “to share ideas on how to enhance the prospects for a peaceful solution” given the common problem that the two countries appeared to be facing at this time with China with respect to territorial disputes. “I assured the Deputy Prime Minister that the Philippines will continue its search for a peaceful solution to the problem, based on international law,” he added. Meanwhile, Binay said he also received some proposals on how to speed up the growth of Japan-Philippines relations, including how to fast-track the program for Filipino nurses and caregivers going to Japan, the creation of sister-city relationships between Philippine and Japanese cities, and the establishment of retirement centers for the Japanese elderly in the Philippines. Moreover, he said that ways and means of supporting the vigorous implementation of public-private partnership (PPP) programs through Japanese investments in infrastructure projects were also discussed. GENERAL SANTOS CITY – Sustainable fishing practices are crucial in reversing the ongoing decline of the Philippine seas, Greenpeace said today during a media briefing in the country’s tuna capital. “We are running out of fish and running out of time. For a country known for marine biodiversity, there are very few fish left to catch,” said Vince Cinches, Oceans Campaigner for Greenpeace Southeast Asia. “The government’s recent plans to import fish from other Asian countries like China and Taiwan is a clear sign that our seas have now collapsed, with the local fishing industry, particularly the livelihoods of small scale fishermen, at risk,” he added. Greenpeace is challenging the Bureau of Fisheries and Aquatic Resources and local fishing communities to look into sustainable fishing methods to prevent what could be an imminent fish shortage. Fish accounts for most of Filipinos’ daily intake of protein, with the average person eating 28 kilos of fish every year. If current destructive fishing practices continue, fish will soon become more expensive, and may even become a luxury. Common species like round scad, or galunggong, has dwindled to the point that it can no longer meet local market demand. Importation will only serve the immediate needs of the population, but will not address the problem of why the sea is no longer self-sufficient. Greenpeace is offering an alternative and sustainable solution to the country’s fishing woes through Skipjack Pole & Line (P&L) Fishing. Together the Bureau of Fisheries and Aquatic Resources (BFAR) and Socksargen Federation of Fishing and Allied Industries Inc. (SFFAI Inc.) the group has organized a 1-day forum at Sidney Hotel tomorrow to discuss the benefits of skipjack pole and line fisheries. Two fishing experts, Bill Holden from the Marine Stewardship Council, of the Australia, and Ibrahim Athif Shakoor, Secretary General of the Pole and Line Federation, of the Maldives, were brought in by the group to share their insights on the safe practice and market viability of P&L. Modern fishing techniques have resulted in unwanted and unsustainable by-catch and over fishing that has wiped out some tuna populations. Pole and line is a traditional method practiced by fishers in coastal communities. It requires the use of a pole, a line, a hook, and a bait boat. A few countries in the South Pacific practice P&L. Both Holden and Shakoor believe that P&L is the best option to revive the seas. They maintain that a well-managed and sustainable fishing is essential for healthy oceans, livelihoods, and economies worldwide. “There is huge potential for P&L in the Philippines. Not only is it safe for the environment, but it also economically advantageous to fisherman who will continue to engage in it, as we have seen in the fishing economy of the Maldives,” says Shakoor. Greenpeace is calling for a full cooperation between government and fishing industries and communities to work together to develop sustainable and responsible fisheries in order to revive the Philippine seas. “More than 70% of the world’s fisheries are fully exploited, over-exploited or significantly depleted, and the Philippine situation is a stark reflection of this sad reality. But there is hope: sustainable practices, such as P&L, should be embraced by all stakeholders. This way, our seas can continue to provide food and livelihoods for the millions of Filipinos in the years to come,” said Cinches. 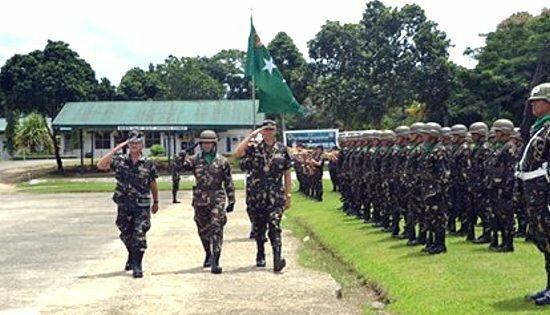 CAMP LUKBAN, Catbalogan City, Samar – Officers, Enlisted Personnel and civilian employees of 8th Infantry Division (8ID) gathered to render an arrival honor for MGen. Gerardo T Layug on July 14 at around 11:00 o’clock in the morning at the 8ID grandstand as a fitting recognition for his well-deserved promotion to the next higher rank. The promotion came as a form of recognition as the Commander of the 8ID, PA and the massive peace and development efforts in the area. In his speech, Layug expressed his gratitude to the Almighty God for giving him the gift of leadership and the strength he needed to overcome the challenges he faced in his long years of service to the AFP. He also thanked the men and women of 8ID for their untiring efforts and continuous commitment to serve the people and to have an insurgency free community. He emphasized that his promotion will inspire him to strive harder and remain committed to lead the 8ID in achieving sustainable development and a just and lasting peace in the area. He also urged all soldiers to be advocates of Human Rights and catalysts of peace and development. After the simple ceremony, Layug together with his wife invited everybody to join him in a “Boodle Fight” lunch – a military tradition of eating together to enhance camaraderie and esprit de corps. MALACAÑANG – Executive Secretary Paquito N. Ochoa Jr. has directed the newly-created Mining Industry Coordinating Council (MICC) and concerned government agencies to begin implementing the comprehensive reforms in the mining sector under Executive Order No. 79. In separate memoranda issued by Ochoa after President Benigno Aquino III signed the executive order last week, he detailed steps to be taken to effect the new mining policies aimed at addressing environmental mining standards, improving revenue sharing, and promoting social economic development and social growth. “In his Social Contract with the Filipino People, the President pledged to lead a government that would encourage the sustainable use of resources to benefit the present and future generations of Filipinos,” Ochoa said. In his memorandum to Environment Secretary Ramon Paje to implement and operationalize the President’s order, Ochoa outlined specific actions to be taken by specific government agencies on issues involving strict enforcement of environmental laws; inventory of social development, management and environment enhancement programs of mining companies; geo-hazard and multi-hazard mapping of areas for mining; determination of the final land use of mining areas once projects are completed, and non-issuance of new mining applications in Palawan, among others. Social Welfare Secretary Dinky Soliman, who chairs of the Cabinet cluster on Human Development and Poverty Reduction, on the other hand, was directed to provide alternative livelihood for displaced mining workers; craft mechanisms and guidelines to monitor human and labor rights violations; complete cultural mapping of indigenous people; and ensure proper working and safety conditions within mining areas and nearby communities. The MICC, which Paje co-chairs with Finance Secretary Cesar Purisima, has been asked to come up with the rules and guidelines for the update the mineral commodity profile, and conduct studies and build databases on new markets, products, and available technologies aimed at the development of downstream industries and value-adding activities. Ochoa also instructed the MICC to determine legislative measures that will ensure efficient and effective management of the mining sector and strengthen regulatory rules, and study the existing mechanisms for revenue-sharing, among others. Budget Secretary Florencio “Butch” Abad, head of the Secretariat of the Good Governance and Anti-Corruption cluster, will determine the specific roles of line agencies involved in mining to address their overlapping tasks and functions, as well as explore the possibility of tapping third-party international auditors to validate the volume and value of mineral exports from the Philippines, Ochoa said. QUEZON CITY – Former political detainees, relatives, and supporters of political prisoners on Tuesday held another picket protest this time at Camp Crame on the second day of their fast to call for the immediate release of 385 political prisoners detained nationwide. Members of Samahan ng Ex-Detainees Laban sa Detensyon at Aresto (Selda), Hustisya, Karapatan and other people's organizations trooped to Camp Crame, where some political prisoners are currently detained (Renante Gamara, Eduardo Serrano and Eduardo Sarmiento). “We were deprived of our rights when we exposed the anomalies and ill treatment of staffs of BJMP, PNP and LGU’s to other prisoners especially Muslim prisoners,” Political prisoners in Camp Crame, Renante Gamara, Eduardo Serrano and Eduardo Sarmiento said in a statement as they join the Nationally Coordinated Fasting of political prisoners in various jails all over the country. In the said statement, they condemned the military guards’ ill treatment to their fellow political prisoner Tirso Alcantara in Fort Bonifacio. “He is being poisoned in small doses,” said the three. They also condemned the transferring of Ramon Patriarca to a military detention after he successfully organized a protest to increase food allowances of prisoners in Cebu Provincial Jail. Selda secretary general Angie Ipong urged President Benigno Aquino III to grant an immediate, general, unconditional and omnibus amnesty to free all political prisoners in the country. "We find no reason why the government is waiting for when clearly all the political prisoners especially the sick, the elderly, those in jail too long, and those covered by the JASIG should have been released earlier," Ipong said. Political prisoners in different detention centers in the country – Calbayog Sub-Provincial Jail, Compostela Valley Provincial Jail, Central Command, Lahug, Cebu, Misamis Oriental, Panay, Cebu, Calbayog, Davao City, are currently until PNoy's delivers his SONA. 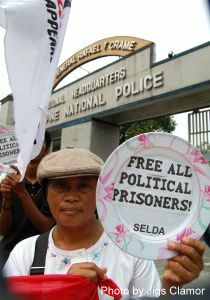 Selda said that of the 385 political prisoners, 107 are arbitrary arrested and detained under the PNoy's administration. "PNoy just continued GMA's Oplan Bantay Laya tactics under the new Oplan Bayanihan to file trumped-up charges against political activists because the government wanted to quell dissent." Ipong added. Ipong urged Aquino to have the "political will" to grant amnesty to all political prisoners in the country. CAMP RUPERTO K KANGLEON, Palo, Leyte – Police Regional Director Chief Superintendent Arnold Rayala Revilla states that this PRO is now conducting deeper investigation to further establish the suspect’s motive, and to determine the real incident of the recent indiscriminate firing that transpired recently in Brgy Cawayan, Catarman, Northern Samar as reported in Philippine Daily Inquirer dated July 12, 2012. In fact he said that in the best interest of impartiality and due process, we are continuously investigating this case. There are no exceptions under the law and the PNP is committed to solve this case quickly. If evidence warrant, suspect/s should be held accountable for their actions and appropriate sanction shall be imposed upon them so that justice must be served. To recall, as reflected on the Brgy Blotter No. 1923 of Brgy. Cawayan, Catarman, Northern Samar at about 10:00 PM of July 11, 2012, at Bayan Muna Headquarters, located at Sitio Bukasan, Brgy Cawayan, Catarman, Northern Samar, Andrew Sudario of legal age, single, Humanitarian Worker and Bayan Muna Chairperson of Northern Samar Chapter and a resident of aforementioned place and Elsa Marino, 17 years old, BS Biology student of UEP, Catarman, Northern Samar while inside the room of said office heard a voice coming from the outside saying in vernacular language “Sige na, sige na”. After a few seconds, they heard a sound similar to that of a firearm but they just ignored it and thought it came from a passing vehicle until they notice that his books were full of broken glass from the jalousie glass window and saw a metal object similar to that of a slug and he advised his companion to turn off the light and remain inside. Based on the Investigation Report relative to the incident, submitted by Northern Samar Police Provincial Office dated July 13, 2012 to the Regional Investigation and Detective Management Division that the investigating body has yet be given a more conclusive statement with regards to the identities and motive of the perpetrators. Thus, a more extensive investigation is required to be able to dig out more information as to who might be responsible to the reported incident. There were no indications based on the after SOCO Report that the said establishment was strafed with bullets as indicated in the news. However, based on the examination conducted by the investigators one bullet hit the window of said establishment using firearm of unidentified caliber. Moreover, investigator is still looking for other possibilities on the manner of its commission which is part of the investigation that is currently being done. Until this date Mr. Sudario did not bother to report to Catarman Police Station the alleged strafing incident. Again, PSSupt. Roel Balintong Acidre, Chief Regional Police Community Relations Division said that the PNP will always be persistent in this campaign against criminality and lawlessness in Eastern Visayas. The PNP will always be relentless in enforcing the law without fear or favor, maintaining peace and order, and ensuring public safety with the active support of the community. All of these the PNP will do so that every Filipino citizen and others who sojourn in the country may live in peace and prosperity. QUEZON CITY – The Philippine Center for Islam and Democracy (PCID) joins the call for setting up of voters’ registration outside the Autonomous Region in Muslim Mindanao (ARMM) for ARMM voters temporarily outside of ARMM. 1. A 17-year old was killed in Lumbac Unayan town, Lanao del Sur obviously from a registration-related matter.